Tired of sitting on the sofa? From movie watching to console gaming, bean bag chairs offer a combination of comfort, relaxation and chill factor that makes them perfect for a huge range of activities. As a result, they are — in our humble opinion — potentially the most underrated seating option available today. Add affordable pricing and cool styling into the equation and bean bag chairs stand out not just as a cool accessory, but as an alternative to a conventional sofa. Thinking of adding a bean bag chair to your living room? From affordable options to high-end, luxurious seating, we’ve reviewed the three best adult bean bag chairs for TV, movies and gaming below. Available for less than $100, the Flash Furniture Oversized Bean Bag Chair is one of the best low-cost bean bag chairs on the market. 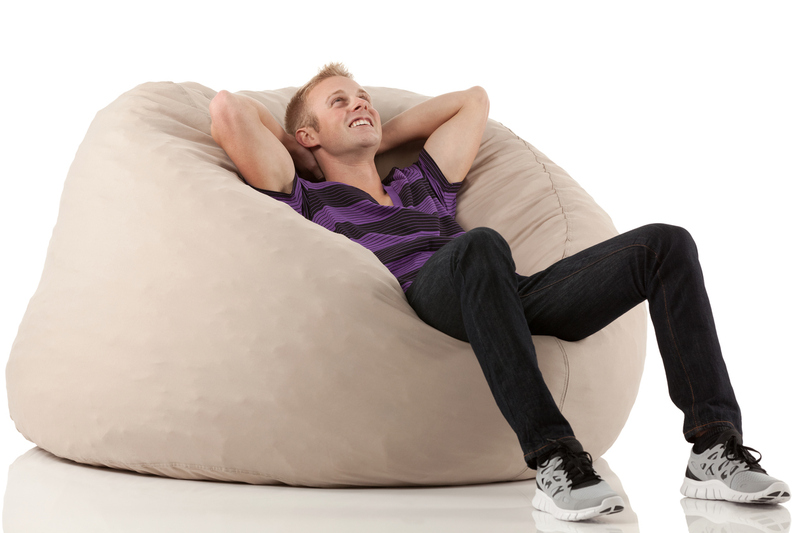 The Oversized Bean Bag Chair has soft, comfortable cotton upholstery that feels smooth and pleasant against your skin. The internal beads are made from breathable polyurethane, with a firm but supportive feel that makes this seat ideal for everyday use. Flash Furniture offers this chair in more than 15 different colours and patterns, ranging from a selection of solid colours to camouflage and polka dots. From a quality perspective, the Oversized Bean Bag Chair outperforms the average, especially for its price range. The cotton feels great, stains come out easily through spot cleaning and the chair itself feels solid and well made. All in all, a great buy for the price. Measuring in at 60 x 60 x 34 inches, the Chill Sack Bean Bag Chair is a spacious single-person bean bag chair that’s ideal for gaming, reading and watching movies. The Chill Sack Bean Bag Chair is filled with shredded memory foam — the same material used in high-end mattress manufacturing. As a result, it has a more supportive, “structured” feel than cheaper bean bag chairs filled with polyurethane filler beads. The exterior of this chair is made from microsuede fiber, giving it a premium look and a smooth, soft feel. Chill Sack offers this chair in upwards of 25 different colours, ranging from hot pink to tan, royal blue and more. If you’re looking for a mid-priced chair that truly delivers on comfort and quality, the Chill Sack Bean Bag Chair belongs on your short list. Priced under $200, this is a high quality bean bag chair that will last for years if properly cared for. 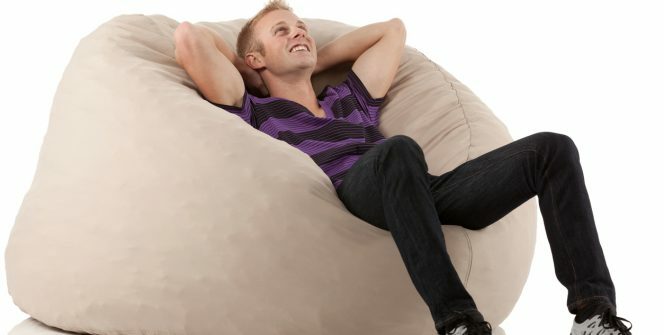 The largest bean bag chair on our list, the Cozy Sack 6-Feet Bean Bag Chair takes up 6.5′ by 4.5′ of floor space. Like the Chill Sack, it uses supportive, comfortable foam to provide a softer feel than cheaper polyurethane bean bags. Beyond its huge size, the Cozy Sack 6-Feet Bean Bag Chair has a premium look and feel that sets it apart from other bean bag chairs. The exterior cover is smooth and comfortable, with a plush texture that hides stains and makes the chair a joy to sit back in. The only downside of this chair is that it requires some serious commitment to set up. Allow at least 24 hours to the material to expand when you first install Cozy Sack in your living room, as well as a few minutes to fluff the bag when you want to sit down. Setup issues aside, the Cozy Sack is an incredible chair. It’s stylish, comfortable and gigantic, making it the perfect alternative to a conventional sofa or armchair for your living room, home theatre room or gaming space.